You might be catching bigger largemouth and smallmouth bass in Utah in the future. On Sept. 23, members of the Utah Wildlife Board reduced the number of bass limits in Utah, from eight major limits down to two. Also, one of the limits -- the one that applies to most of Utah's bass waters -- will allow anglers to have more than one bass over 12 inches long. Division of Wildlife Resources biologists hope the new limits will draw anglers to bass fishing who are willing to keep some of the fish they catch. The fishing changes the board approved do not go into effect until Jan. 1, 2011. 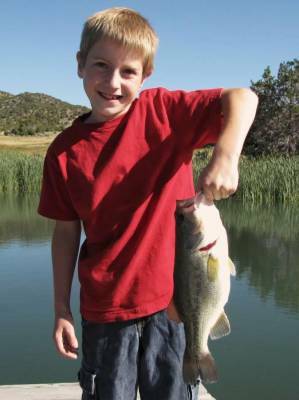 At most of Utah's bass waters, you can keep six bass of any size. You can also keep six bass at Utah Lake and at Jordanelle, Quail Creek, Sand Hollow, Gunlock and Huntington North reservoirs. But only one of the six fish can be longer than 12 inches. Biologists would also like to simplify the bass limits at Lake Powell and Flaming Gorge. But they need to do more work with biologists in Arizona and Wyoming to make that happen. If you think of Utah's bass fishing waters as a big cookie jar, it helps to understand why they have so many small fish: with the exception of Lake Powell, anglers keep only 4 percent, or less, of the total adult bass population at Utah's bass waters each year. Anglers release at least 96 percent of the bass they catch. The amount of room in your imaginary cookie jar is limited. If you want to fill the jar with good-sized cookies, you'll have to remove some of the crumbs to make room for the cookies. "Right now, many of Utah's bass waters are filled with bass in the nine- to 12-inch range," says Drew Cushing, warm water sport fisheries coordinator for the DWR. "Anglers need to remove some of the smaller bass to make room for the bigger fish. The smaller fish are eating most of the food and taking up most of the cover." Cushing says the new limits should benefit all bass anglers, ranging from those who are new to bass fishing to those who have fished for years. "Beginning anglers aren't as concerned about catching a big fish," Cushing says. "They're happy catching smaller fish. And they want a chance to keep some fish." Cushing says it's tough to get new anglers interested in bass fishing when the state has eight different bass limits, including some that are fairly restrictive. "Having fewer and less restrictive bass limits will make the limits easier to understand and give anglers a chance to keep some fish," Cushing says. "We think that combination will draw more anglers to bass fishing." And that, in turn, should result in bigger fish to catch. Cushing says Jordanelle, Quail Creek, Sand Hollow and Gunlock are four waters where biologists believe bass can thrive under more restrictive regulations. Allowing anglers to keep six bass -- but limiting them to not more than one bass longer than 12 inches -- should keep plenty of big bass in these waters. Cushing says that won't happen, though, unless those who fish the waters are willing to keep bass that are less than 12 inches long. "If they don't take some of the smaller bass," he says, "it will be difficult for the bass to grow to a larger size." Cushing says the regulation at Huntington North should give bass in the reservoir some extra protection. "The water level at the reservoir fluctuates a lot," he says. "In fact, the water levels in all of our bass waters are the limiting factor facing bass in Utah. Good water years mean great fishing. Poor water years mean poor fishing." All of the fishing changes the board approved for 2011 will be available in the 2011 Utah Fishing Guidebook. The guidebook should be available by early December.